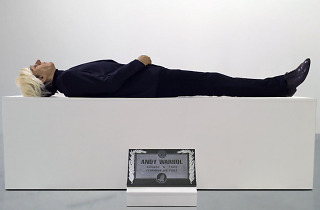 Its centerpiece is a life-size hyperrealistic sculpture of Warhol's corpse dressed in black, stretched out on a white plinth with a reproduction of his gravestone sitting in front on the floor. 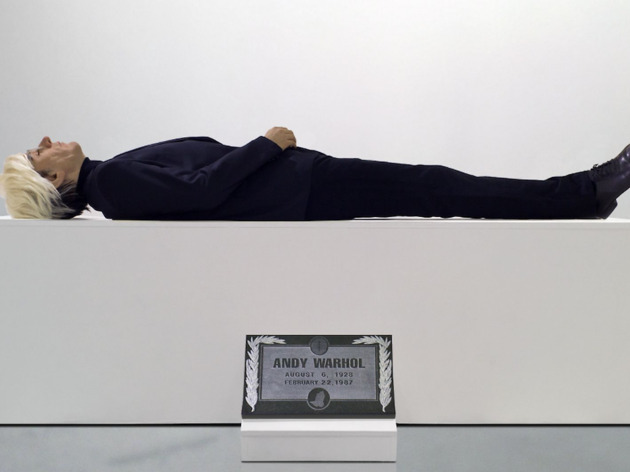 The installation also includes a functioning souvenir shop selling T-shirts, postcards and mugs, along with self-guided tour maps of places around NYC associated with Warhol, like the Factory. Merino describes the piece as a critique of the tourism industry, and it's probably true that if Warhol had been preserved and interred à la Lenin's Tomb in the middle of, say, Union Square (where the second and most famous iteration of the Factory stood), there would have been lines around the block waiting to get in. As it is, this show will have to do.